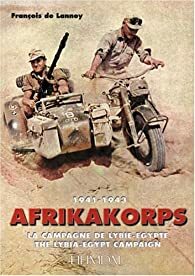 Germany's Afrikakorps of World War II became one of the all-time greatest military legends. With German offensives stalled on other fronts, Third Reich photographers gave maximum coverage to the Afrikakorps and its charismatic commander, Erwin Rommel. La 1ère DFL - Les français libre..
Ordres et décorations de la We..
La libération des camps, un mi..
Koursk: La plus grande batai..
La Grossdeutschland : Du régim..